Christoph Jakob Trew was a distinguished wealthy physician, one of the most important of the age, with a strong interest in natural history. He published a series of magnificently illustrated volumes on plants, the most famous being “Hortus nitidissimis omnem per annum superbiens floribus”, a florilegium of ornamental garden flowers. 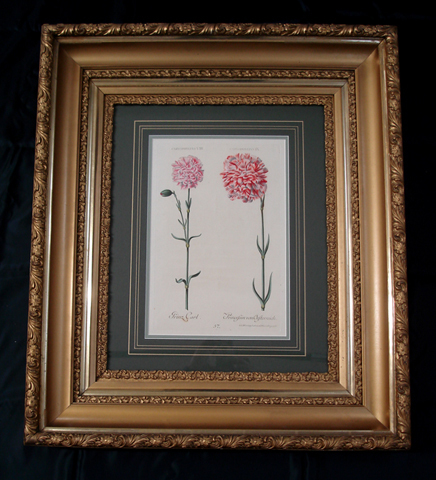 Its illustrations are among the most sumptuous handcolored botanical prints ever produced. Rather than pursuing scientific precision, the artists and engravers for whom Trew served as a patron attempted to depict the innate beauty found within the floral kingdom utilizing unconventional techniques. One such technique was applying watercolor mixed with a chalk-like material, resulting in a plate that looked more like a painting. The most famous botanical artist who contributed to the book was Georg Dionysius Ehret, who produced the designs for 40 of the eventual total of 188 plates, while the remainder were drawn up by a team of local artists including J.C. Keller, Professor of Drawing at Erlangen University; the court painter Nikolaus Eisenberger; and A.L. Wirsing.